Opinion: after five cyclists die on London roads in nine days, Dan Hill asks whether driverless cars would make our roads safer, or whether dependance on "an algorithmic organisation of society" would only encourage complacency. Each morning I cycle the wrong way up a one way street, on my way to Fabrica from the old town of Treviso where I live. This is after riding up on the pavement for a bit, and then dodging down a few narrow pedestrian-only lanes. I am not alone in this relentless recidivism. In fact, everyone does it. I even cycled past a police car going the wrong way today, which perhaps provides us all with a kind of collective immunity. Like many aspects of old Italian towns, this just works. Everything is constantly, steadily, if slowly, moving in all directions. It's like an emergent organism, highly aware of all of its component parts and its overall performance, with hundreds of people working as individuals - and with a vested interest in their own safety - but also highly attentive to their role as part of a wider ecosystem - and so intrinsically aware of the safety and movement of others too. This attentive mode is essentially the thinking behind the famous "shared space" principle of traffic planning, pioneered over the last few decades by the revolutionary Dutch planner Hans Monderman. It holds that the safest way to design an intersection, for instance, is to actually remove all curbs, traffic lights and signs - and the data backs it up. I related this idea to city officials in Dubai on Tuesday morning, who looked on in amazement at YouTube videos of shared space systems in the Netherlands. Medium-density intersections, gloomy in the misty Lowlands light, but with a constantly moving parade of bikes, cars, buses, vans and pedestrians. No external controls, fewer collisions. It feels effortlessly better than the frustrating stop-start delivered by most contemporary traffic planning. Add traffic lights to intersections and you get accidents, as drivers in effect outsource their decision-making to software. In this sense, orthodox traffic engineering makes people less safe and holds cities back from moving to a more civilised condition (take note, Boris Johnson). It's a lesson for urban planners generally, particularly around the unthinking use of technology that we sometimes hear within the "smart cities" movement. Do we want active, engaged citizens taking responsibility for the way their cities work, or passive citizens who outsource their decision making to algorithms? My favourite Cedric Price line is "Technology is the answer. But what is the question?" We jump on particular technologies - those that gave us car-centric mid-century urban planning, for instance - without stepping back to consider what the real question might be, and hence uncover a wider range of possible solutions. Listening to the latest pronouncements from Google, Tesla et al about self-driving cars I have similar concerns. While the self-driving car movement says it wants to reduce the horrific number of traffic accidents by removing the element of human error from driving, they may still be a solution in search of a problem. Here we see such companies are not actually interested in genuine change, for all their bluster about "radical disruption". Self-driving cars are a sticking plaster over existing conditions. They actually reinforce the Californian Ideology that underpins today's mobility problems: suburban sprawl, based around the possibility of lengthy car-based commutes, in turn predicated on a highly individualistic view of society. It is an entirely conservative move. Self-driving cars provide a way of changing the veneer of this system, as no-one is brave enough to suggest changing the system itself. They replace who, or what, is holding the steering wheel, but not the underlying culture that contributes to mass depression, obesity epidemics, climate change and economic crises. Self-driving cars may be safer - though as Bryant Walker Smith of Stanford Law School's Center for Internet and Society points out, the jury is still out on whether people will actually want them. "People are not comfortable with robots killing them," he says. Imagine the legal implications of such an accident. Who is legally responsible? The coder? If we are interested in safety, the condition I see from my bike every day, or in the Netherlands, is clearly safe. And it uses no new technology; it is a framework for participation amongst its users, and thus it works, as people take responsibility. Self-driving car advocates might say "Well, this shared space thingy might work in cuddly social democracies like the Netherlands, but not a real car culture like the USA or Australia." But a) recall I live in Italy, and b) remember also Copenhagen's decision, against the tide of orthodox urban planning in the mid-60s, to build around pedestrians and bikes rather than cars. 40 years later they enjoy a highly coveted urban environment. This was no accident, or culture simply playing out, but instead active choice. Every year you delay making such choices, because they are seen as not part of today's culture, you delay genuine change. The real way to prevent accidents would be to have fewer cars on the road, not just the same number with different control systems. But is the car industry really going to suggest that? Self-driving cars may move traffic a little more efficiently, but the laws of induced demand suggest that the supply of cars might also increase to counter any such benefits. Few industries could get away with as much blood on their hands as the automobile business does. That we are prepared to expend so many lives - 1.24 million killed each year on the roads, and who knows how many other lives ruined - for the sake of our freedom to drive to work is fairly objectionable. Even if we don't have accidents, research indicates that lengthy commuting leads quite simply to dying sooner—that is, after becoming fatter, sleeping worse and getting divorced. Happy happy, joy joy. Equally, it is in the interests of technology industries to propose technology as a solution. We don't spend enough time thinking through the impact of an algorithmic organisation of society. This particular issue was explored in designers Dunne & Raby's excellent United Micro Nations exhibition at London's Design Museum recently, with depictions of an entire society based around algorithmic mobility alongside critical questions of the socio-economic structures it might generate. And when Tesla, as a hybrid of both sectors, say they are interested too - in Elon Musk's casual, can't be bothered, am I Tony Stark "Well maybe I'll just make one of those, then again maybe I won't (yawn)" kind of way - it doesn't really change the situation of massive resource waste within a car-oriented culture. Again, this is the inherent conservatism within the Californian Ideology - they actually don't want to change the socio-cultural patterns that they have done well by. To them, technology enables them avoid talking about changing an unsustainable lifestyle. They want to have their cake and eat it. And then get fat. Yet imagine the possibilities of a city oriented around people living closer to their work and play, and so built around cycling, walking, quality public transport and a massively reduced number of electric cars for individual errands. It doesn't exactly have the airbrushed sheen of Google X, but it would be a city with a lower carbon footprint, healthier people, safer streets, more frequent social interaction, better air quality, quiet enough to hear conversations, to hear birds and to build lighter, more experimental building envelopes, with a higher economic performance through serendipity, agglomeration, richer mixed-use land use, and with increased citizen engagement in the city itself. The benefits are virtually endless, and few are even addressed by self-driving cars, never mind achieved. Yet as we will always need some cars, they may as well be self-driving. We might then get over the absurd idea of people driving themselves to work or to play. What a waste of time, space, energy and cognition that is! It's a blip in human development that we may look back and laugh about. Or cry. For all the emotional appeal that cars are associated with, most tasks do not involve an Audi TT gliding around a bend in the Dolomites, sadly, but glum, mildly desperate, slogs through dreary clogged arteries. The FT reports that "the average American spends 38 hours a year stuck in traffic. Cars spend more than 90 percent of their lives idle." And think of the spatial haemorrhage involved in parking space, which is somehow generally empty and unusable. Around 81% of Los Angeles's CBD is parking lots. Imagine the economic potential in actually using that space. The allure of cars, albeit a fantasy most of the time, is significant though. They are wonderful machines, after all. So why not reframe them as "something for the weekend"? Around freedom, excitement, identity, at your leisure. And here we get to the real potential of software for mobility - in enabling car-sharing. Given the extraordinary waste of life, carbon and space involved in an expensive product spending most of its life doing nothing, why not really reduce the number of cars required in the first place, via mass, distributed car-sharing schemes? You choose the vehicle fit for your needs at that point, thus reinforcing the idea that mobility is a bespoke, mass-customised on-demand service shared across bike-sharing, public transport, and through shared self-driving cars for those times when you really need one. Software-enabled sharing is far more radical than simply software-enabled driving. We have seen how bike-sharing schemes are beginning to redraw our urban fabric. We can see the growth in the community garden movements. We can see how shared space systems creates a safer, more engaged way of moving around. Self-driving cars have none of these dynamics, simply using software to reinforce what are actually pre-internet ideologies. Folding self-driving systems into car-sharing schemes, as part of a wider rethink about how we live together in cities, however? I could share that vision. 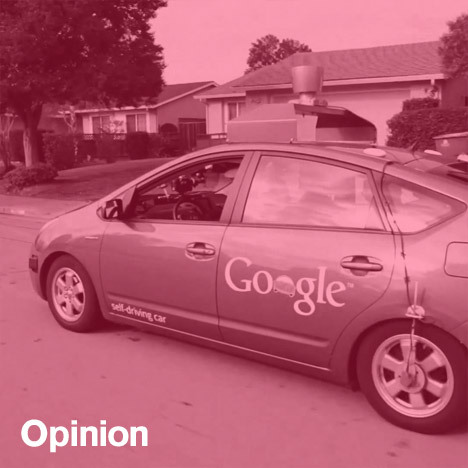 So again, what is the real question that suggests self-driving cars are the solution?